Journal of Applied Sciences in Accounting, Finance, and Tax is a forum provided for researchers, both from universities, practitioners and the industrial world. The publication is a result of research, studies or ideas on Accounting, Finance, and Tax. 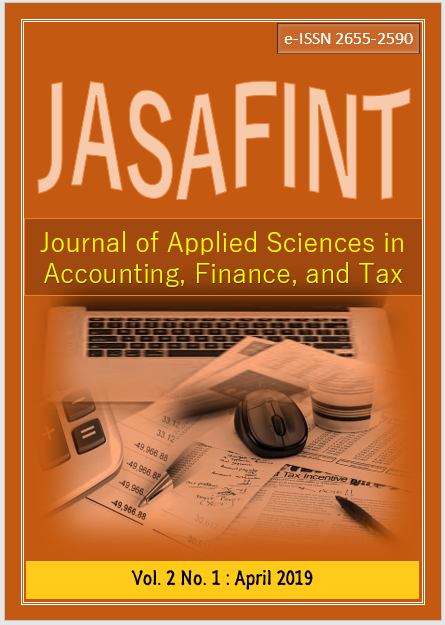 JASAFINT is published with a focus and scope on issues on Accounting (Financial Accounting, Management Accounting, Public Accounting, Auditing, and Accounting Information Systems), Finance (Capital Market, Financial Statements Analysis, and Financing), and Tax (Income Tax, VAT, Tax Audit, and Tax Accounting).